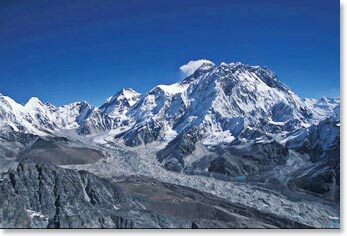 Berg Adventures offers a climb of Lobuche Peak as an extension to our Everest Base Camp trek. Stand atop the glaciated peak of Lobuche at 20,076ft/6119m for a uniquely rewarding 360 degree view of the Himalayas. From the stunning base camp site to the snowy summit ridge, Lobuche will keep you both physically challenged and visually delighted. Offering spectacular views from the summit of famed peaks such as Ama Dablam, Makalu, Nuptse, Pumori and, of course, Everest, the Lobuche climb is perfect for adventure travelers looking to gain climbing experience in the Himalayas. Your adventure begins with a trek to Everest Base Camp and climb of Kala Patar with our regularly scheduled Everest Base Camp Trek. You will arrive in the bustling city of Kathmandu, tour the city’s many religious and historic sites and browse the outdoor stores for any last minute climbing gear needs. From there you fly to the village of Lukla – the gateway to Everest’s Khumbu Valley. The quiet and slow-paced life of the Khumbu will feel like a different world, especially in comparison to the hectic city life of Kathmandu. There are no road and no cars in the Khumbu – just trails, yaks and your own two feet. After a visit to Everest Base Camp and a climb of Kala Patar, you will continue on to Lobuche Base Camp where your climb begins. We will establish our high camp near a hidden lake in a rocky hollow along the southwest face near 18,212ft/5,551m. Lobuche Peak is an alpine climb of moderate difficulty. You should have some experience walking with an ice axe, using crampons and doing self-arrests. Summit day will require a pre-dawn “alpine start” and your team will need to move efficiently on fixed lines. Your guides will review the necessary skills with you, but it is essential that you are familiar with the use of your climbing equipment before the trip. View our previous Lobuche dispatches.